Hotel Au Manoir St. Germain Des Prés, Paris. Au Manoir St. Germain Des Prés Hotel Paris. 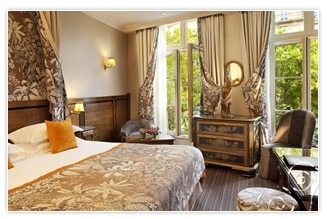 Au Manoir St. Germain Des Prés is a characteristic 4 star property in the famous quarter of St. Germain. Perfect for a typical Parisian stay, facing the well-known the "Café les Deux Magots” and the Saint-Germain des Prés Church. A family-like and charming atmosphere welcome guests, while rooms are equipped with every comfort. At the hotel you can enjoy your breakfast in a refined atmosphere in front of the flowered garden, right in the heart of the historic Paris.